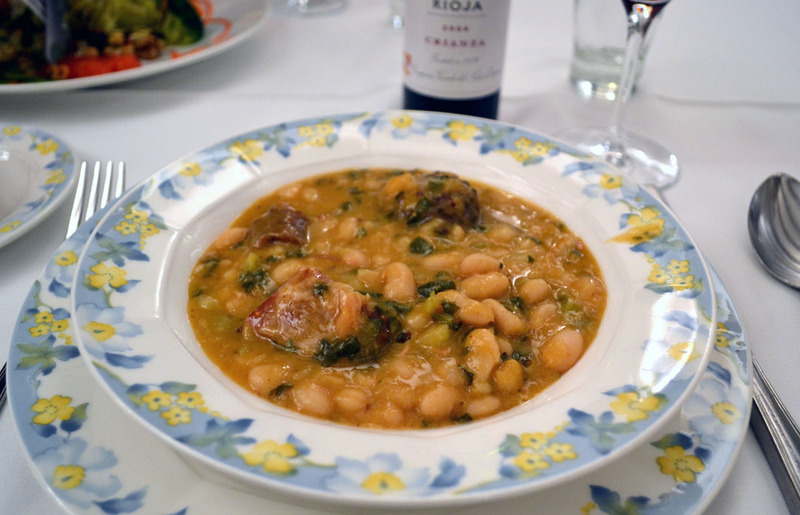 This is the seventh installment of our Beyond the Five Boroughs series on Northern Spain. 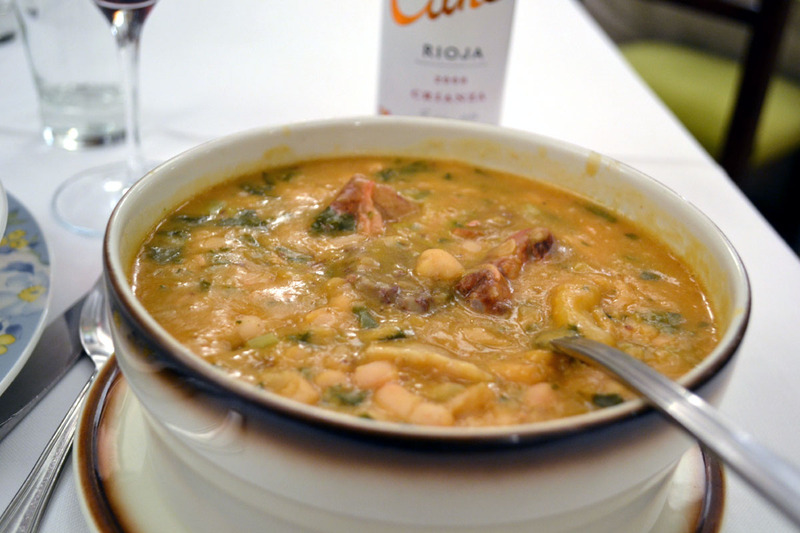 The first post was on the foods of Barcelona. The second and third were on the Basque cuisine in Hondarribia, Saint Jean-de-Luz, Espelette and San Sebastian. The fourth through sixth were a three-part review of the renowned Restaurante Arzak in San Sebastian. The last post is on the foods of Galicia. The mountainous regions of Cantabria and Asturias in Northern Spain are visited infrequently by American travelers, which is a mistake. 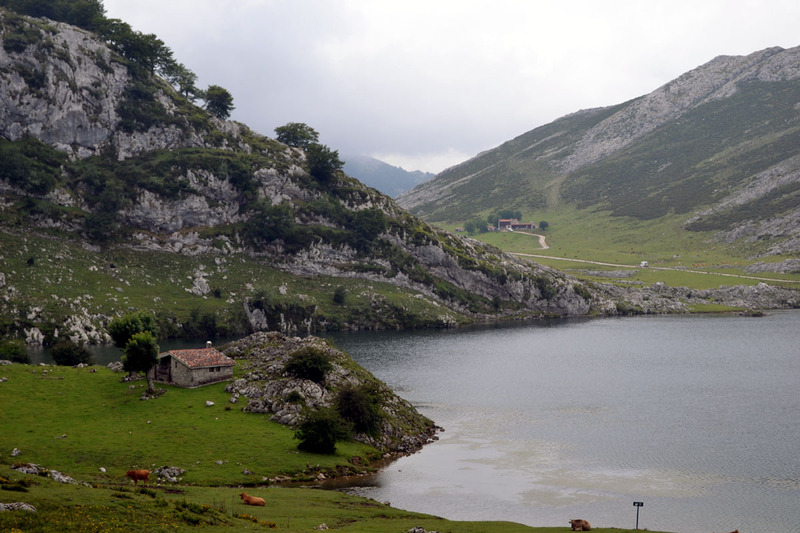 The area offers stunning natural beauty, perfect for hiking and picnicking, with lush green landscapes and the craggy mountaintops of the Picos de Europa national park situated right up against the blue coastal waters. Plentiful sheep, cows and wild horses roam the hillsides, rounding out the pastoral scene. In addition to beautiful scenery, the area also offers terrific food. In contrast to Basque gastronomy, with its focus on fresh seafood and modern innovation, the cuisine of Asturias and Cantabria offers a more homey feel, with comfort foods to warm the body and spirit against the cool mountain air. Local apples are turned into sparkling cider and the livestock roaming the hills help produce a wide range of cheeses. The cocido arrived in a round casserole with a long ladle for spooning the stew into bowls. As it was set on the table, we could immediately smell the warmth and smokiness of the stew—the richness of slow cooked meats, the smoky pimentón in the chorizo. This was Grandma’s home cooking, perfect comfort food after a drive through the mountains. The preparation hearkens back to a time when small morsels of precious meat were stretched as far as possible by simmering them with more inexpensive beans to let the the flavors seep throughout. It was served with a warm, complex Rioja wine and a salad of vegetables, fresh local cheeses and nuts. We slept soundly and awoke the next day ready for our hike through the Picos de Europa. On the other side of the mountains we arrived in the region of Asturias, with its crystal clear lakes high up in the mountains. The Asturianos are very proud of their cheeses, especially queso cabrales, a blue cheese made with raw cow’s, goat’s, and sheep’s milk. The lush green pastures and hillsides of this mountainous region make for happy sheep and the Asturianos reap the rewards. Other than being enjoyed plain or on a toast with some nuts and jam, queso cabrales may be put to other culinary uses. 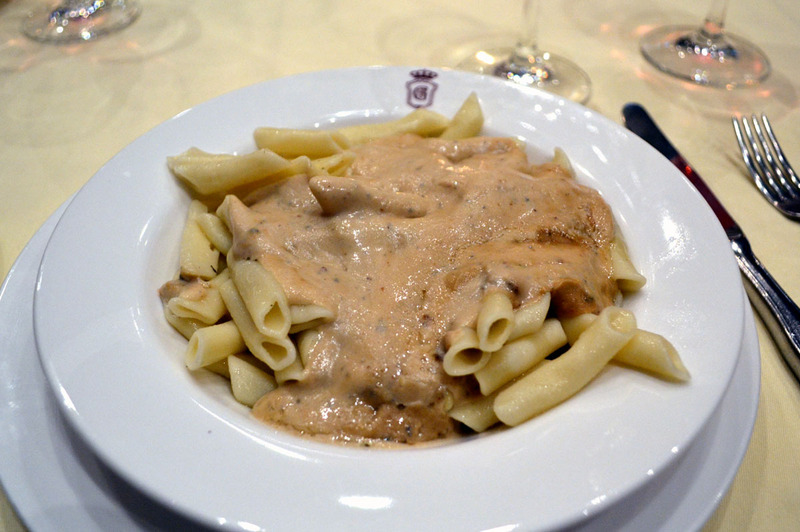 As a sauce for pasta, it has a creamy, strong blue cheese flavor, but without any of the abrasiveness one might expect from blue cheese sauce. Queso cabrales is best washed down with sidra asturiana, a sparkling cider that may be the region’s second-most famous culinary offering. 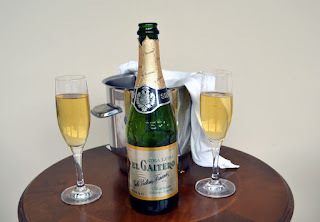 Containing about 4.8 percent alcohol, the cider has a similar flavor and mouthfeel to light champagne but with a sweeter, fruitier taste, making it refreshing but not at all syrupy. The cider is delicious alone or as a pairing for cheese or food, but it also makes a delightful sauce for fresh fish. 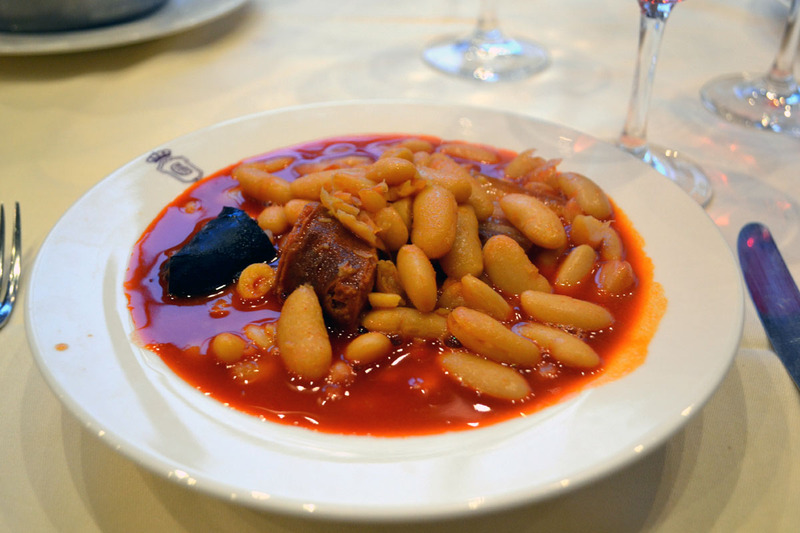 The regional staple of Asturias is the fabada asturiana, a bean stew adorned with chunks of chorizo, morcilla and other meats. It has a warm, smokey aroma that hits you as soon as it arrives. More soupy than the cocido montañés we had in Cantabria, the fabada has a vibrant red color and a pungent flavor of smokey pimentón. It was served everywhere, from the hotel’s dining room to the cafe by the lakes in the mountains.